Mansfield Town have signed frontman Omari Sterling-James from Solihull Moors. The talented 23-year-old joins the Stags following an exceptional individual campaign with the Moors in the National League. The former Birmingham City trainee had spells in non-league football after leaving Blues as an 18-year-old. Following a number of impressive performances, he then secured a move to League Two side Cheltenham Town. 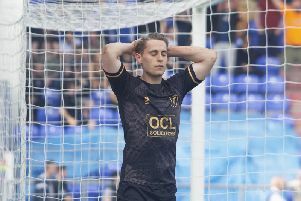 After making his professional debut against Brighton and Hove Albion, he drifted out of the team and linked up with Solihull Moors last summer. The Birmingham-born frontman scored on his debut in a 3-1 victory over Sutton United and also picked up a number of the Man-of-the-Match awards throughout an impressive campaign. Sterling-James became a vital cog in the Moors’ side and was rewarded with a new deal at Damson Park after scoring back-to-back braces over the Christmas period, scoring in a 4-4 draw with Dagenham and Redbridge and a 3-2 victory over Chester.